Meredith grew up in Michigan, where she enjoyed watching squirrels, birds, and insects, had a pet toad, and was very interested in ancient civilizations and languages. She combined these interests in exciting ways beyond her wildest dreams by becoming a conservation researcher, following degrees at Princeton University and Oxford University. She did her PhD in Ecology at the Pontificia Universidad Católica de Chile, which started a 10-year-and-counting engagement with the ecology and conservation of central Chile, a Mediterranean-climate global endemicity hotspot. In 2014, Meredith started a project to reintroduce guanacos into central Chile in order to restore the ecosystem processes that have been missing from woodlands since the guanacos’ eradication by Spanish colonists. Her research team and collaborators carried out the first release to the wild of guanacos, and only the second release of any species, in Chile. To fill the gaps in basic research needed to support the scaling up of the guanaco project, she has researched perceptions and cultural narratives around local animals and landscapes, forest succession and impacts of anthropogenic forest uses in central Chile, attitudes of local farmers to conservation programmes that try to get them to change their behaviour, and most recently cattle raising practices and their impact on woodlands. Meanwhile, she has been a postdoc at the Ecology Department of Pontificia Universidad Católica de Chile, at the School for Geography and the Environment at Oxford University, in the Aarhus University Research on the Anthropocene group in Aarhus, Denmark, and in the Sciences for Action and Development department at the National Institute of Agricultural Research in Paris, as well as an associated researcher at the Institute for Ecology and Biodiversity in Santiago, Chile. 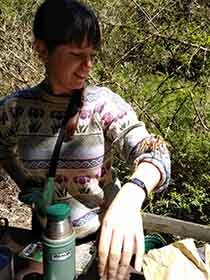 Currently she is the outreach officer for a European project on urban biodiversity (BIOVEINS) at AgroParisTech, a visiting researcher at the Musée de l’Homme in Paris, and a postdoctoral associate with the Center for Applied Ecology and Sustainability in Santiago. She has also collaborated in research projects on restoration ecology in the Po Delta, Italy, and on shrubs, degradation and livestock in Lesotho, southern Africa. She collaborates frequently with anthropologists, artists and other biologists. The theme across Meredith’s work can be described as ethnobiology. She hopes to do more comparative fieldwork in dry woodlands of Africa and South America, and work with communities to develop sustainable conservation and livelihood solutions. She is also an artist and writer.